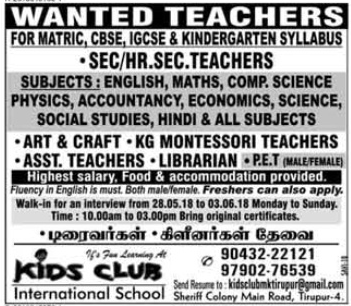 Kids Club International School, Tirupur has advertised in THE DINAMALAR newspaper for the recruitment of Teachers vacancies. Interested and eligible job aspirants are requested to appear walk in from 28th May to 3rd June 2018. Check out further more details below. About School: Kids Club Matric. Hr. sec.school is situated in a pleasant nook of sheriff colony away from the pollution but in the heart of Tirupur city. It started functioning from 11th October 1997 with 5 students for KG section and has now gradually grown up to XII Standard. The Fundamental aim of Kids Club is to provide each child with a comprehensive quality education imparted by proficient enthusiastic and committed teachers. Tirupur. Tamil Nadu - 641 604.